Another more recent back catalogue album, the title track here is like an epic and lush journey on a Persian magic carpet that becomes a hypnotic spiritual incantation! Everywhere on this recording there are surprise twists and turns! There are operatic bursts, pop, folk, classical and ethnic melodies and rhythms all blended together like a lavish banquet. It is by turns a tender, profound, poignant, exciting, adventurous and above all, spiritual mix of vocal and instrumental pieces. The U.K.’s Asher Quinn is an eclectic new age and spiritual music performer. 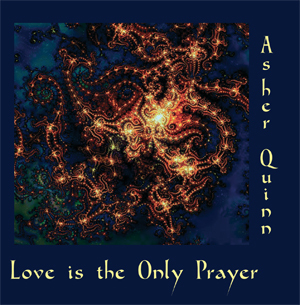 Love Is The Only Prayer was originally released in 1997 on the New World Music label, and now on Asher’s own label, Singing Stone Music, Love Is The Only Prayer is a mystical journey through classical religious and spiritual traditions with glorious female and male vocals reminiscent of anything produced by Enigma, Ancient Future or Deep Forest. The album’s title track, 'Love Is The Only Prayer', is a lengthy epic running over sixteen minutes long. However, the time goes by quickly as the opening melody weaves through a catchy and paradoxical universe with male and female vocals reciting parts of the title throughout in a trance-like delivery. The music is distinctly new age with symphonic strings, guitar, marching-rhythm drum work, and soaring flutes. The strikingly operatic 'Adoro Te' is a perfect interlude without instrumental accompaniment for a limited time of only thirty seconds. The upbeat, female-led 'Hymn of the Universe' is a sacred anthem with a good rhythm and backup vocals, and female lead vocals similar to anyone from Celtic Woman. 'Shakespeare' includes a short reading in English as spoken word before Asher begins singing with electronic accompaniment, strings, steel drum, and female vocals on 'Prayer for the World'. Asher’s voice is somewhere between R.E.M.’s Michael Stipe and Ed Kowalczyk, the former lead singer of Live. 'Love’s Philosophy' is another spoken word piece by Asher before operatic segments with electronic washes and a meditative drum rhythm enter and takes the total run to over thirteen minutes. The drum rhythm and instrumentation is somewhat like Enigma’s worldwide hit, 'Return to Innocence'. The operatic parts are fine, but may be best suited for another song. The very short 'Gayan' is only nine seconds long, but it is the perfect prelude to the English-lyric track, 'Love Call'. The slower melody and Asher’s vocals backed by flute and guitar almost suggest a Spanish influence. If 'Love Call' is the most beautiful track on the album, then it is also the most enjoyable. The combination of Asher’s voice, light percussion, and melodic rhythm is engaging enough for anyone within earshot. The 'Moon' is another nine second track that repeats the phrase "The moon is coming…The moon is coming." Coincidentally, the next track is titled, 'The Moon Is Coming'. On this track, the keyboard rules, and little in the way of outside percussion drives it. The music is fairly simple, yet engaging enough for the listener to keep listening. The last track, 'An Angel Watching Over You', seems like an ode to the heavens. The keyboards create a soft backdrop, while the acoustic guitar makes a few bright notes of ear-pleasure. The final track is somber, but provides a glimmer of hope for the future with varying degrees of dark and light tones with a cascading musical device. The end of the song is analogous to the end of a film with all the feelings of pleasure, hope, and despair in the world. Asher’s Love Is The Only Prayer is a musical journey of heavenly proportions with brief accents of Latin language, Spanish guitar, Mediterranean rhythms, new age vocals, and inspirational melodies. The only quibble is the use of operatic vocals on 'Love’s Philosophy', as the instruments on the track do not require the use of vocals. Still, Asher has a way of producing quality results. This is highly recommended for fans of new age, spiritual, and instrumental music. It is difficult to choose my favourite Asha song, but I am very taken with 'Love's philosophy' from Love is the Only Prayer. I find this track undescribably beautiful. Dear Asha, I am a great fan of yours. You are my most favourite New Age artist. I have to say that you have really excelled yourself with Love is the Only Prayer. My favourite track is 'Love's philosophy'. This I play over and over again. I play Love is the Only Prayer almost every night before going to sleep. The title track I think is your best composition ever, and I have all but one of your CD's. I just never get tired of hearing it. I was visiting my sister who was dying of cancer. I was feeling very low when I walked into a tiny candle shop in Holmefirth in Yorkshire. As I entered, I heard this fantastic music, and I immediately felt uplifted. I asked what it was but the sales assistant said she didn't know, it was just background music. After persuading her to ring the owner in his other shop, and me speaking to him for 5 minutes, I walked out with the CD. It was Love is the Only Prayer. The title song is just wonderful! Dear New World, Asha is one living legend! It's incredible how in each new work he finds the way to create new, good, uplifting music language.